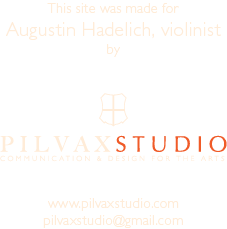 Augustin Hadelich (born 1984) has already won acclaim for his recordings of Haydn and Telemann. Now he tackles a programme of technically challenging works, one, moreover, where each composer presents different difficulties. He meets and surmounts all obstacles, yet it's not technical wizardry that most impresses but his musicianship. He makes the musical sense of each piece crystal clear, and his playing has an inner life; each phrase, each note, is felt as it's played. The Bartók third movement, "Melodia", has constant expressive variation of tone colour and emphasis, and the sonata's Hungarian character comes out particularly strongly, due to Hadelich's idiomatic rhythmic sense. In the Fourth Paganini Caprice, Hadelich is unusually successful in integrating the sustained music with the intervening brilliant passages, and the Ninth Caprice is delightfully buoyant - it's good to hear this piece as Paganini wrote it, without the traditional added harmonics near the end. Of the Ysaÿe sonatas, No 3 is given an appropriate sweeping narrative character, while in No 5 Hadelich maintains a beautiful tranquillity for the initial portrayal of dawn and, in the following "Danse rustique" catches exactly the poised rhythmic quality the composer asks for. The Zimmermann makes a spectacular conclusion to the recital; Hadelich has clearly grasped the full import of its intense, climactic final toccata.